Whether you have been an insurance agent for 10 days or 10 years, you can't afford to not offer your clients a Commercial Umbrella policy. Whether you have been an insurance agent for 10 days or 10 years, you can't afford to not offer your clients a Commercial Umbrella policy. When shopping for the policy thought, what do you look for? What are some red-flags you should be aware of? 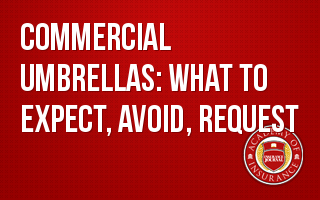 Join us for this webinar where Chris Longo will take us through all of the necessary questions and answers when looking to purchase a Commercial Umbrella policy so you will feel confident your policy will work for you. This webinar is geared toward insurance agents & brokers as well as any interested insurance professional.